A proposed urgent-care clinic at the corner of Elmwood Avenue and Amherst Street in north Buffalo may be on life support after the city's Zoning Board of Appeals this week rejected three variance requests because the project would harm the neighborhood. Caliber Brokerage and WellNow Urgent Care want to build a 3,500-square-foot medical clinic at 1597 Elmwood Ave. and 709-711 Amherst St., a building designed by Silvestri Architects, Excel Engineering and Tredo Engineers. The companies planned to demolish two houses and two commercial buildings – including the homes of used textbook store Bucks4Books and ENS Signs – before rezoning the Amherst Street parcels and combining the lots into a resulting 0.457-acre property. Officials said they needed to include the two extra properties because the Elmwood site doesn't have enough room for parking on its own. To make the project work, the developers sought four variances for the front, rear and side yards, and for side-yard parking, citing safety and need for patients and staff. 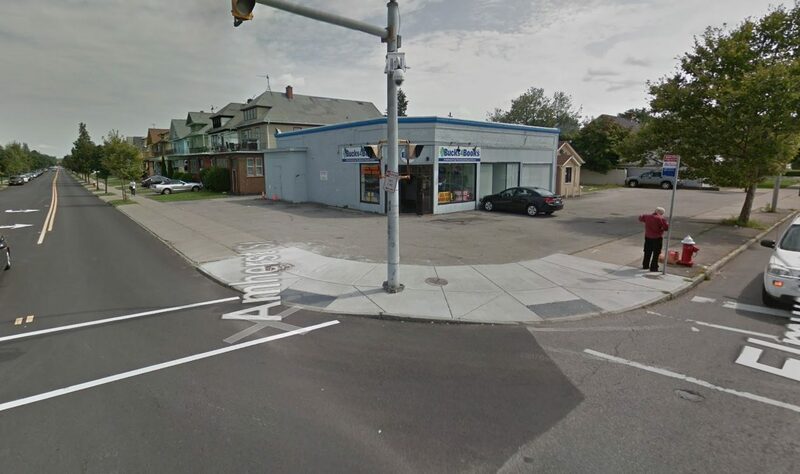 Officials also said in their application to the city that the proposed building is designed as "an anchor for the corner of Elmwood and Amherst Street" and that it would not be "a detriment to the nearby properties." But the ZBA disagreed, denying the requests because of the "undesirable change to the character and physical conditions of the neighborhood that the proposed variances would produce." The project does not require Planning Board approval, but it does require rezoning by the Common Council, as well as demolition and building permits. The developers had hoped to start work by mid-April and finish the core and shell of the building by October. WellNow officials said they would continue to pursue the project. "WellNow Urgent Care remains optimistic that project’s developer and architects will continue to work with the Zoning Board to find a mutually agreeable solution and that this proposed project will ultimately gain Zoning Board approval," said WellNow President Dr. John Radford. "WellNow Urgent Care is excited about the prospect of serving the Elmwood residents and surrounding neighborhoods in the near future." Separately, the ZBA also denied one variance for a planned three-story office building project on Jefferson Avenue by developers Nick Sinatra and David Pawlik. The variance, which related to the amount of paved surface and the number of parking spaces, was one of seven exceptions that Sinatra and Pawlik sought for the proposed 35,000-square-foot building, designed as a nonprofit hub, at 1200 Jefferson. Pawlik said the defeat is not significant and that it just means there will be fewer spaces than the 104 that were planned. "The development clearly is moving forward with this minor adjustment, and we are looking forward in breaking ground this summer with a July 2020 completion date," he said. Eran Epstein's proposed conversion of former Fedders Manufacturing Works and Fedders Automotive Corp. building at 57 Tonawanda St. in Black Rock into 80 apartments and mini self-storage units. The project will be considered by the Planning Board on March 25 at 4 p.m.
A request by Eric and Leigh Fox of Amherst to construct two three-story brick and masonry townhouses above an existing one-story shop on a 0.081-acre lot at 433 Ellicott St. One storefront on the ground level would be a glass garage door to access two parking spaces per townhouse, while the other would be a commercial space. The family plans to occupy one of the townhouses.